I love learning of raw pet food companies that I had not previously heard of. To me, this indicates a greater public interest in raw feeding, which is always a good thing. Five Star Raw Pet Food was developed because of the belief (fact in my opinion) that dogs truly THRIVE on a raw, natural diet. Five Star sources all of it's ingredients in the US, and is produced in the US. All of their products are USDA inspected, certified and approved. Five Star raw is completely balanced, formulated by a Ph. D animal nutritionist. All recipes are meat-based, and include organs, finely ground bone, and fresh vegetables. They are convenient-subscription plans are available, and the products are delivered directly to your door. Five Star sent us each of their flavors to try out. The food arrived in a cooler box, frozen completely solid, which is nice. They currently have five formulas available, four of which are single protein source diets. 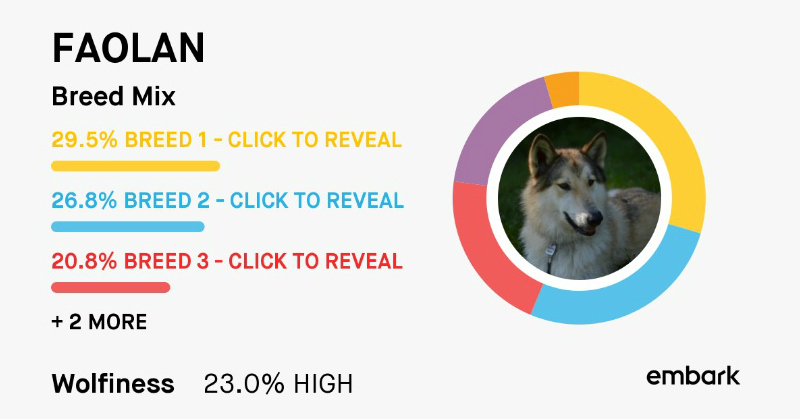 They offer both duck and turkey diets, which are an option for dogs with allergies to more common proteins. The food comes in one pound chubs, which is perfect for my crew. 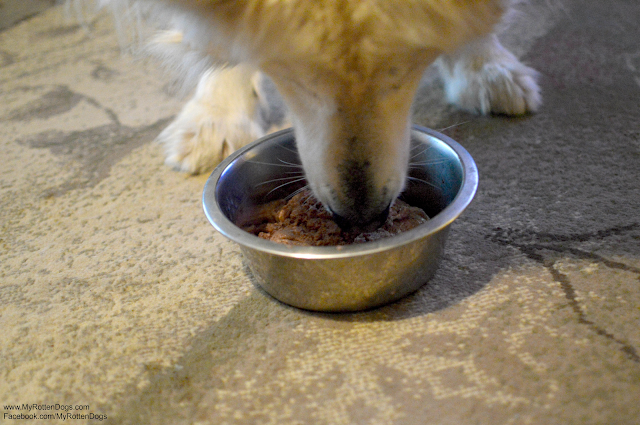 My dogs eat about two pounds each per day, split up between two meals. 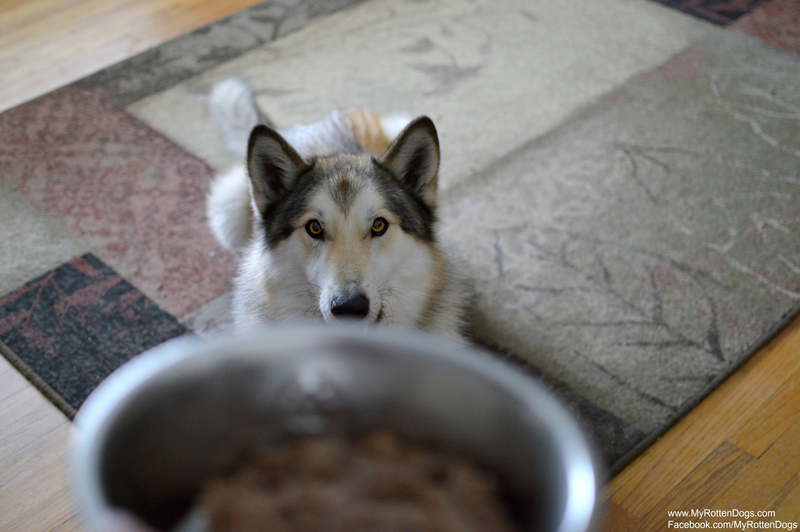 If a dog needs less food per meal, the food is easily divided up or portioned out, and can be safely thawed then refrigerated for three days. Unfortunately for Bruce, this contains selenium yeast (which is perfectly acceptable), so only Neeko and Faolan were able to enjoy it. Little boy CAN be patient. My first thought upon opening the package was "This smells good!" I am sure this is do to the inclusion of vegetables. It is very finely ground, which makes it easily edible for all dogs, small dogs included. The fine grind is perfect for puppies, and weaning young puppies onto a raw diet. It also makes it easy to stuff into a rubber toy such as a KONG. The princess eagerly eating her Five Star Raw. Faolan inhaled his initial offering, licking the bowl clean so eagerly that he scooted it across the floor. Neeko did as well. However, the princess occasionally has texture issues. When offered a second serving of thawed Five Star the following day, she turned her nose up at it. I placed that food in the freezer for about 1.5 hours, and it partially froze. She then ate it with no issues. Apparently that particular day she was being picky about texture. Feeding frozen or partially frozen is my go-to maneuver when she is in that mood. Neither Bruce nor Faolan have texture issues. Feeding frozen is not recommended for very small dogs. New to raw or want to try Five Star? Five Star offers an awesome starter pack. 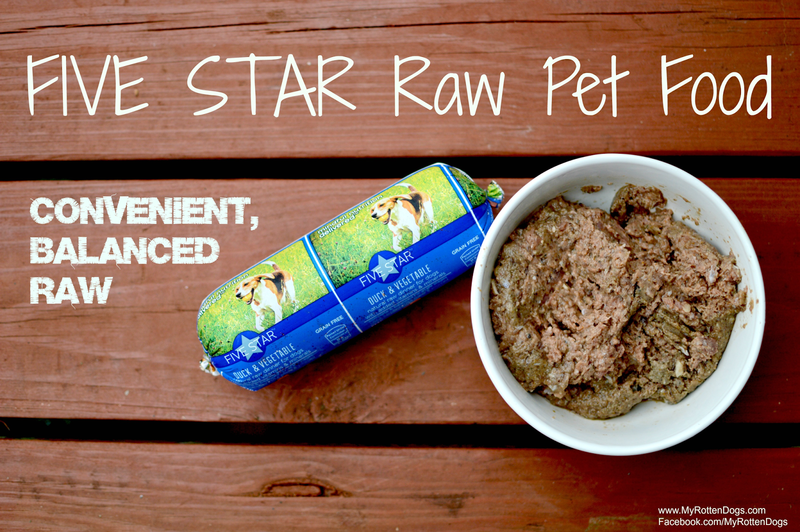 It is perfect for those who are considering raw, new to raw, want to see if Five Star will work for their dogs, or want to offer their dogs some variety. It is also quite inexpensive. For just $12.99, which includes shipping and handling, Five Star will ship one pound of each of their flavors straight to your door. I personally think this is an amazing offer. 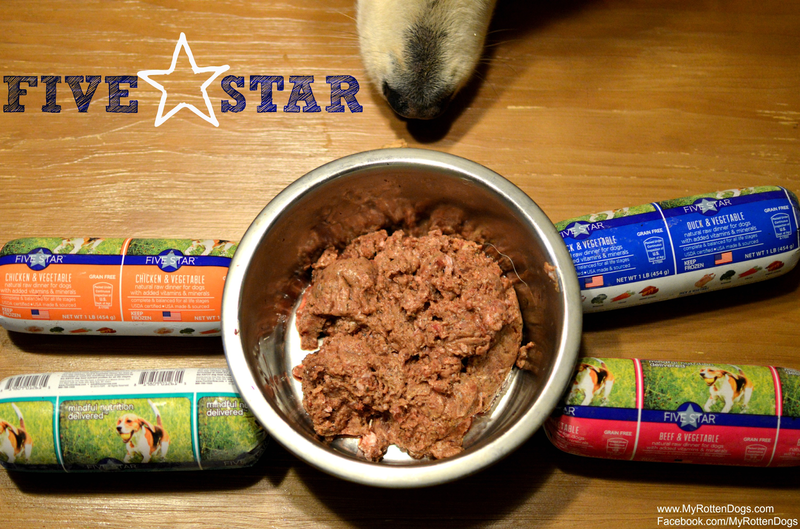 I am quite pleased with our experience with Five Star Raw Pet Food. I love that they are source and make their products in the US, in a USDA facility, without the use of high pressure pasteurization. They offer a variety of formulas, and ship straight to your door. If I hadn't already heard of them, I would jumping all over their trial offer. Find Five Star on Facebook and Twitter. 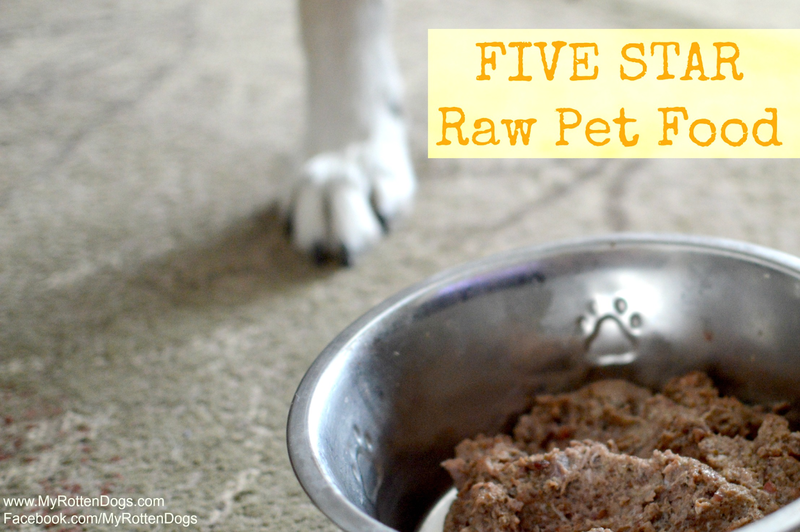 This post is sponsored by Five Star Raw Pet Food, but all opinions are my own. 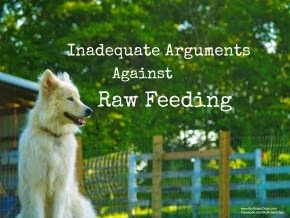 I am being compensated to spread the word about Five Star Raw Pet Food, but Five Star is not responsible for the content of this post. Looks like a great company! I'll check them out! That IS an awesome starter offer!! 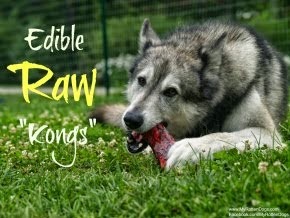 I began our raw feeding journey with pre-packaged raw, ground meals, and it really doesn't get any more convenient than that. All you have to do is pull it out of the fridge and serve.